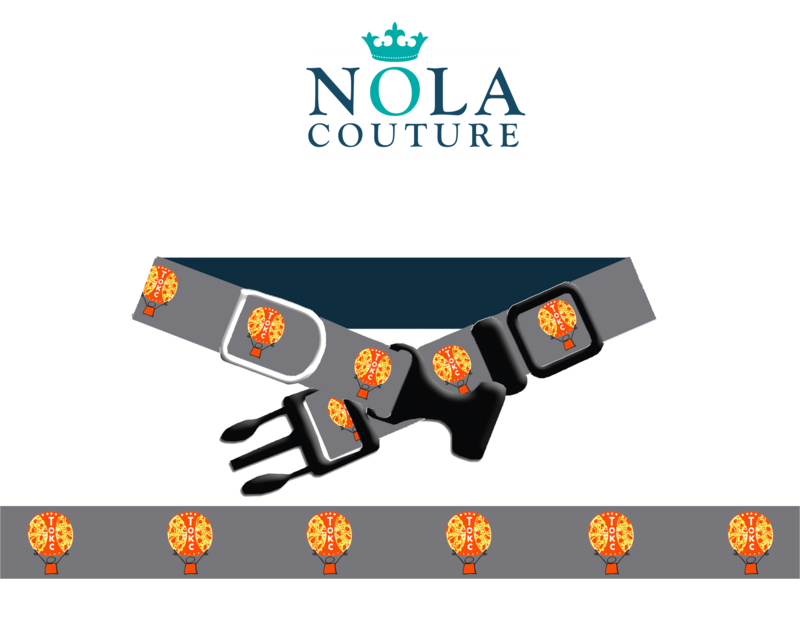 Help spread awareness while spoiling your furry friends with these exclusive TOKC Dog Collars by NOLA Couture! Help spread awareness while spoiling your furry friends with this exclusive TOKC Dog Leash by NOLA Couture! 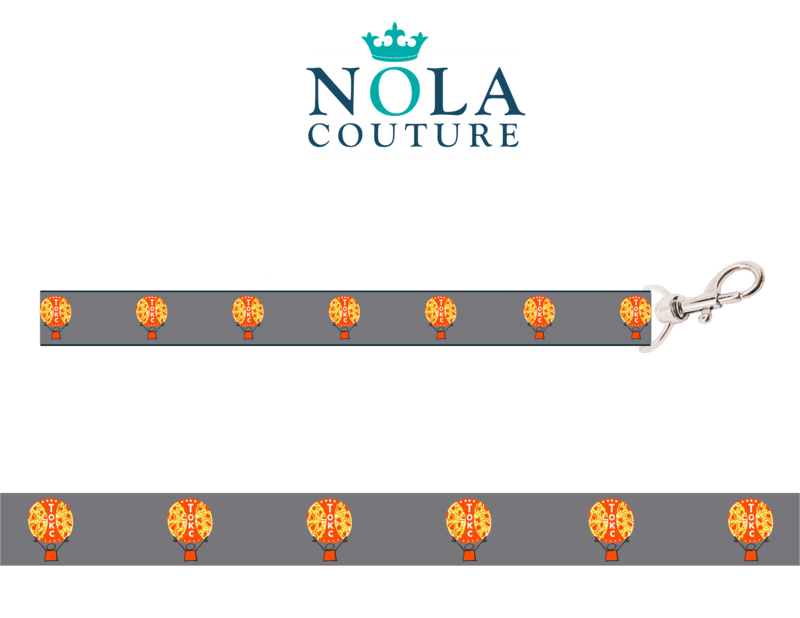 Dress to impress while helping to spread awareness with this exclusive TOKC Woven Tie by NOLA Couture! 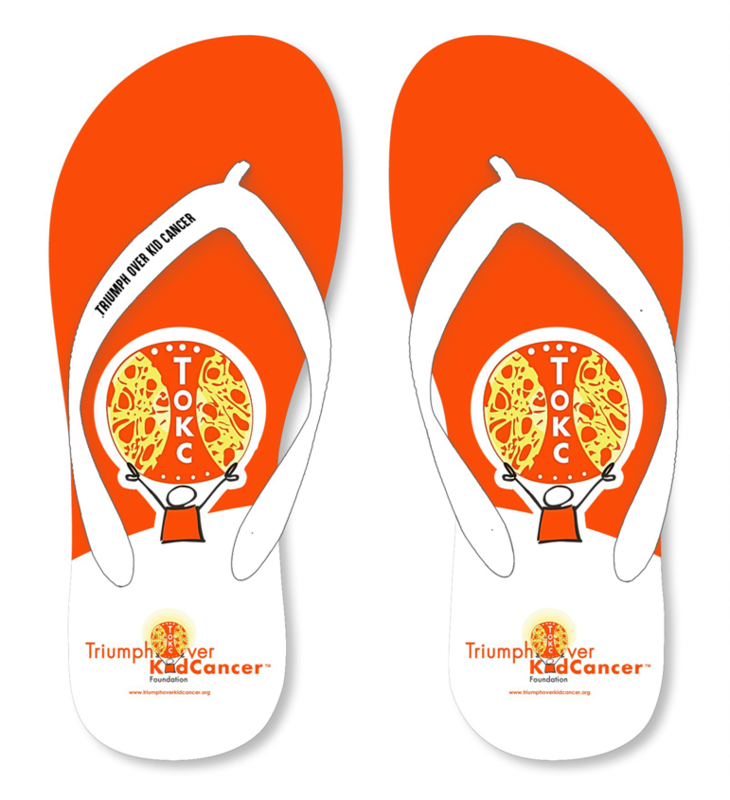 Beat the heat and treat your feet while helping spread awareness in our NEW custom TOKC Flip Flops! These trendy TOKC Pearl Bracelets by L&RK are a great way to give back, with 50% of the proceeds going back to the Triumph Over Kid Cancer Foundation. 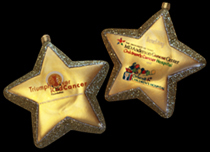 TOKC ornament in honor of James' dear friend Buddy who died of cancer. Buddy's friendship and kindness helped James to see his life with cancer from a new perspective. 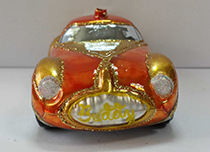 In our lives we all have a "Buddy", a friend whose perseverance through the dark shadows of cancer, opens our eyes and hearts to the horrors of this disease, inspiring us to be more giving as we work to save everyone's “Buddy” from that fate. The Triumph cause memory band has been part of the foundation since the beginning. 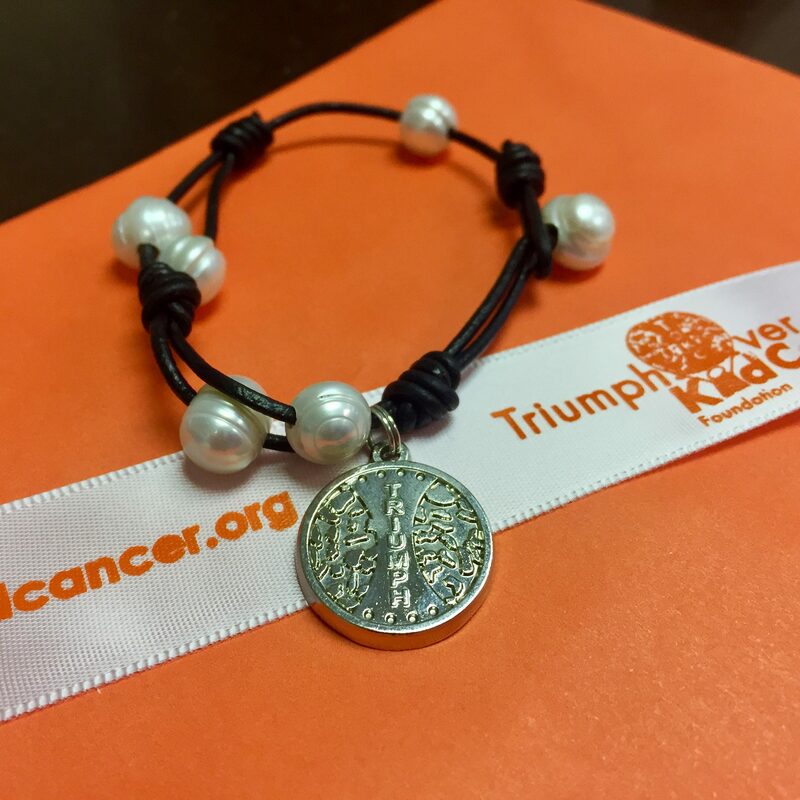 Your meaningful donation, commemorated with the Triumph cause memory band, brings us one desperately needed step further towards advanced treatments for a cure to Pediatric Bone Cancers. 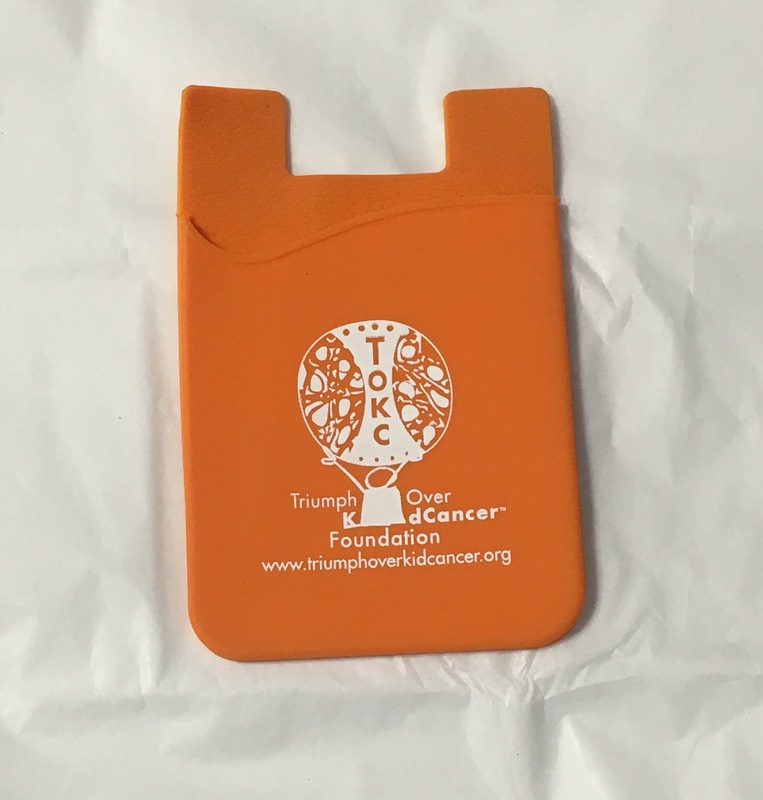 Band together with hundreds of past supporters as you brand yourself with the distinctive orange of Triumph Over Kid Cancer. 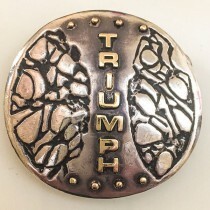 This is the belt buckle that James and his cousin Ely designed for the very first Triumph Over Kid Cancer toga party fundraiser in 2007. The background is the actual image of microscopic osteosarcoma cells which have been magnified. 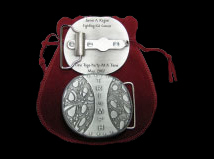 The middle figure is a tree trunk to represent the strength of life overcoming cancer. 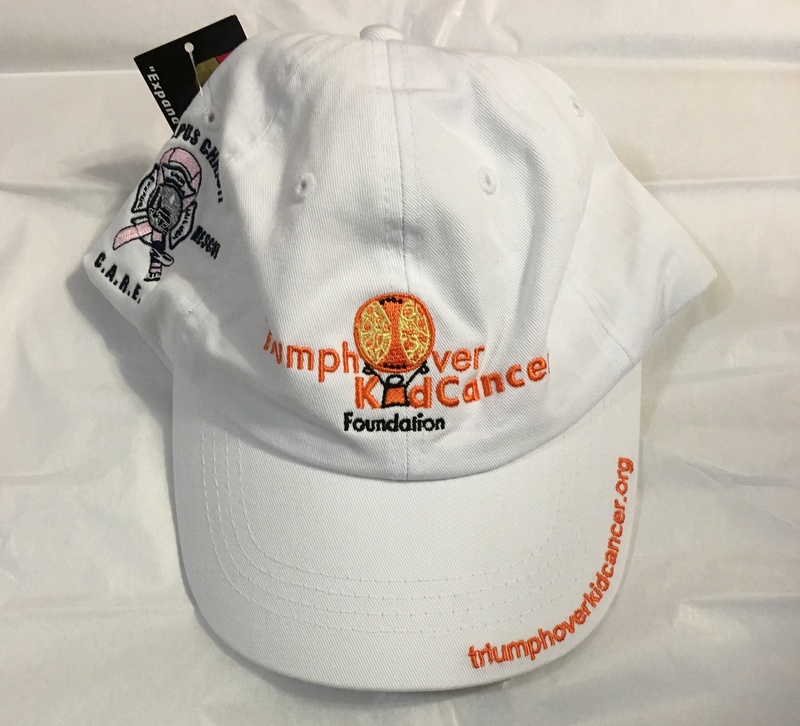 Finally, it is inscribed with the word "Triumph" to symbolize the strength of all the children with bone cancer and the Foundation's hopes for the future. 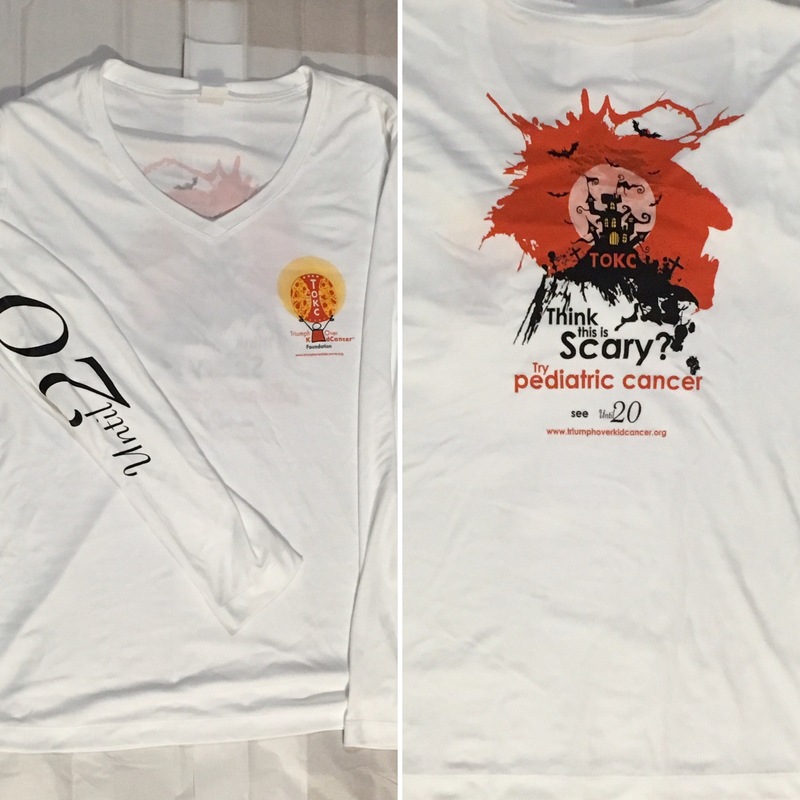 The resulting beautiful and meaningful image is a distinctive celebration of the incredible strength of all of the children with bone cancer and a reminder of the desperate need for funding for advanced treatments for Pediatric Bone Cancer. 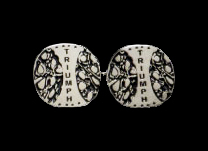 An incredibly classy accessory for the professional man or woman, these zinc cuff links with an antique pewter finish feature the beautiful and meaningful Triumph logo. Wear them to a business meeting, interview, or to a special dinner, and be set apart. Precisely manufactured, they are both elegant and durable. A perfect gift with meaning for the person who has everything. 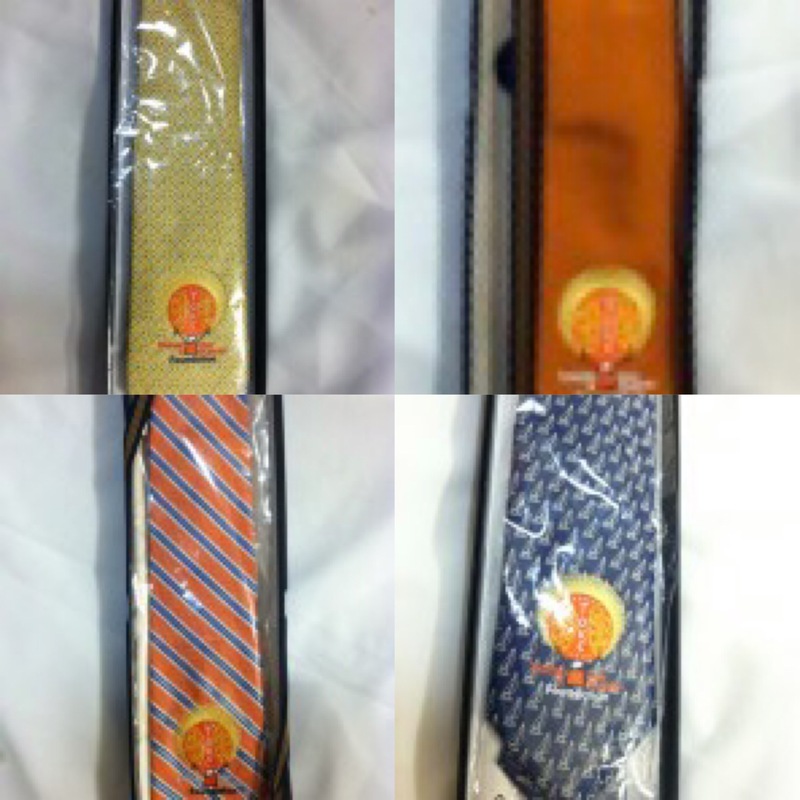 Dress up your outfit with one of these TOKC golf ties! 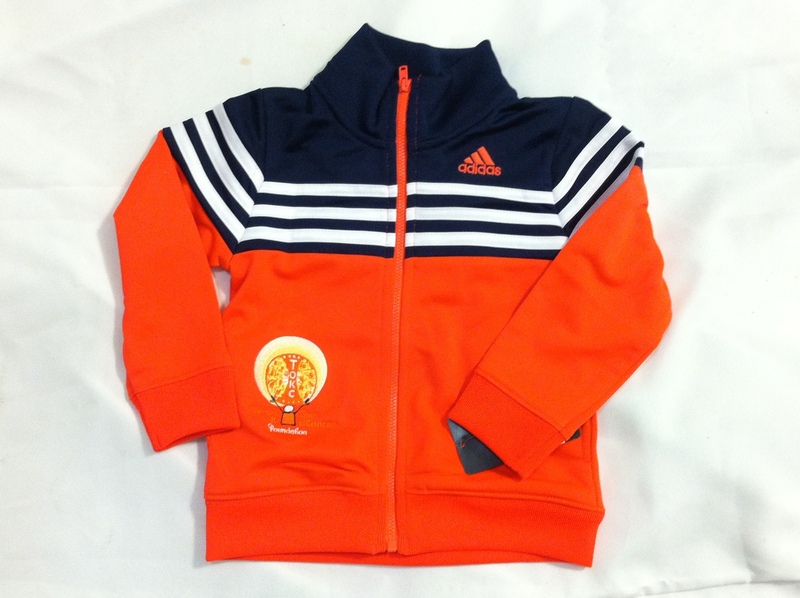 Available in Gold, Sailboat, Deep Orange & Blue Striped, Orange. 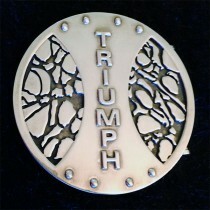 Proudly display the beautiful and meaningful Triumph logo whenever you hand out a business card or pay for a purchase. This classy and rugged money clip is a perfect accessory for a man or a woman. 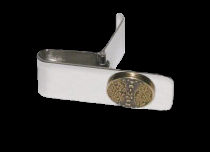 Precisely manufactured from rugged bronze and stainless steel, the clip firmly and securely holds cash, business cards, or credit cards. A perfect gift for dad, your new grad, or just because. Adult Male-Female Sizes. 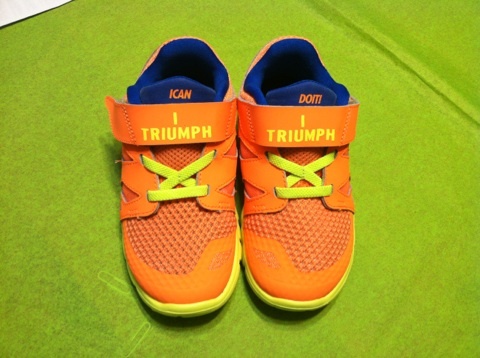 The original pair of "I Triumph" Nikes were designed by our Co-Founder James A. Ragan as a fun way to honor TOKC. 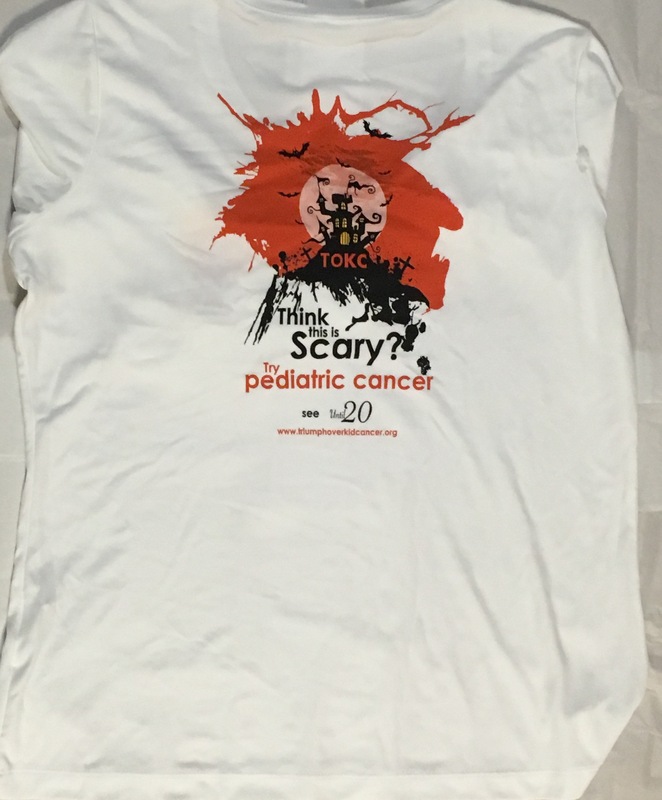 Years later, they are still just as popular and serve as a daily reminder that by working together, one day, we will triumph over kid cancer. 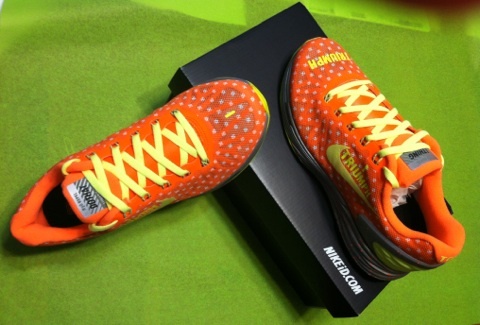 The most recent "I Triumph" design comes in a Nike LunarGlide 6 model and are bright orange with some neon yellow accents. Whether you're a serious runner or just looking for a cool new pair of running shoes, these "I Triumph" shoes are the perfect pair for you. Youth Sizes The original pair of "I Triumph" Nikes were designed by our Co-Founder James A. Ragan as a fun way to honor TOKC. Years later, they are still just as popular and serve as a daily reminder that by working together, one day, we will triumph over kid cancer. The most recent "I Triumph" design comes in a Nike LunarGlide 6 model and are bright orange with some neon yellow accents. Whether your child is a serious runner or just looking for a cool new pair of running shoes, these "I Triumph" shoes are the perfect pair for them. Every child needs a good pair of running shoes to play and run around in, and what better way to play than in a pair of "I Triumph" Nike running shoes! 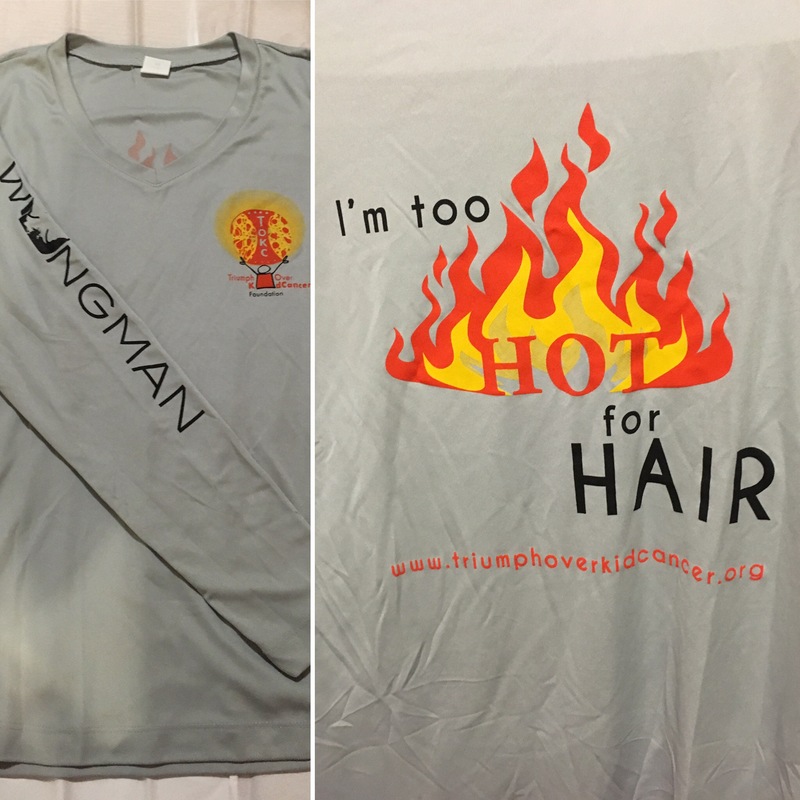 They're bright, fun, and the proceeds go to support a worthwhile cause. 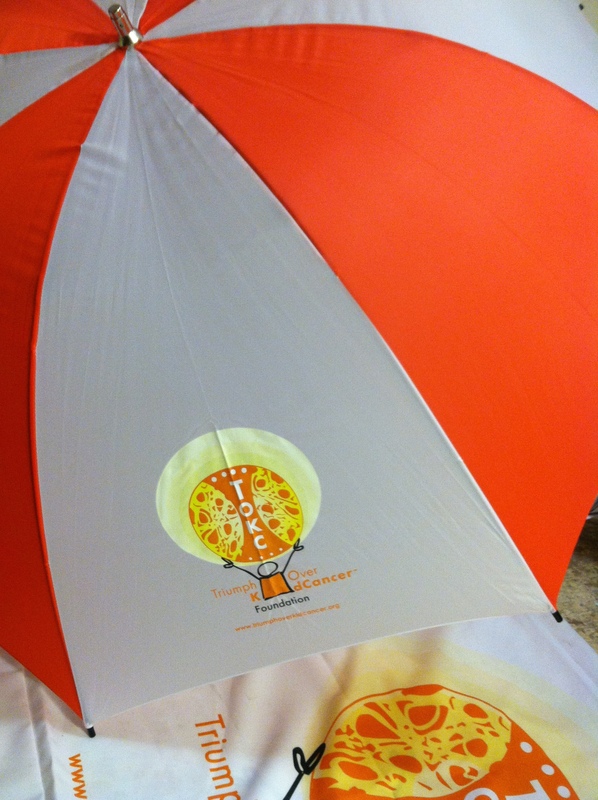 Our large TOKC umbrellas are perfect for keeping you out of the rain or the sun! 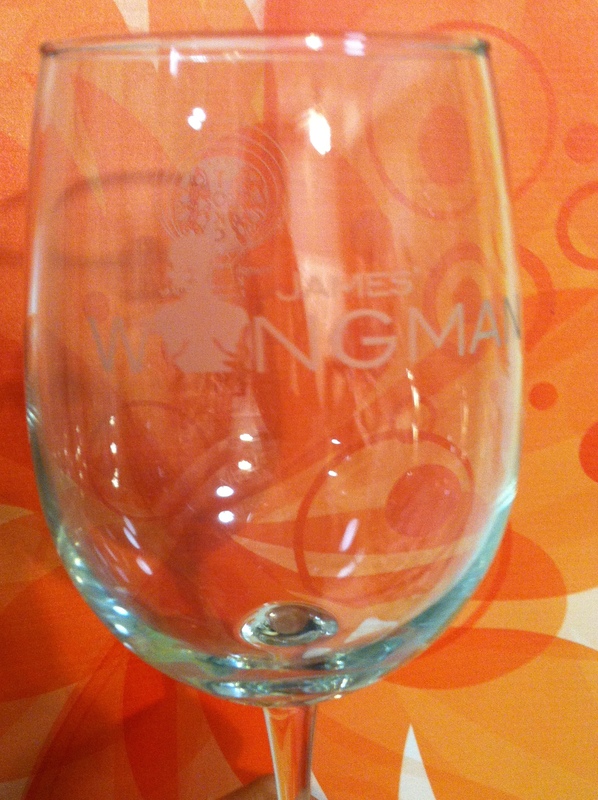 Enjoy your favorite wine in one of our signature James’ Wingman wine glasses! 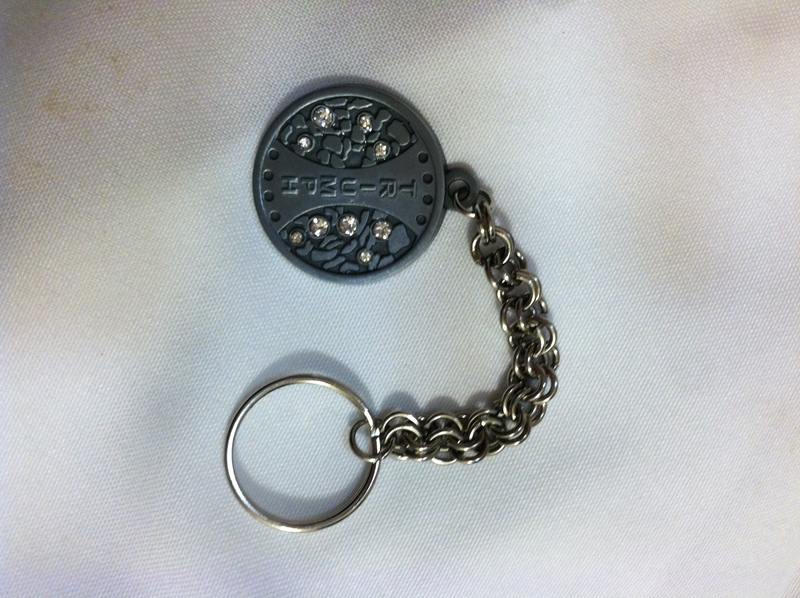 Keep your all of your keys in one place with the TOKC keychain! 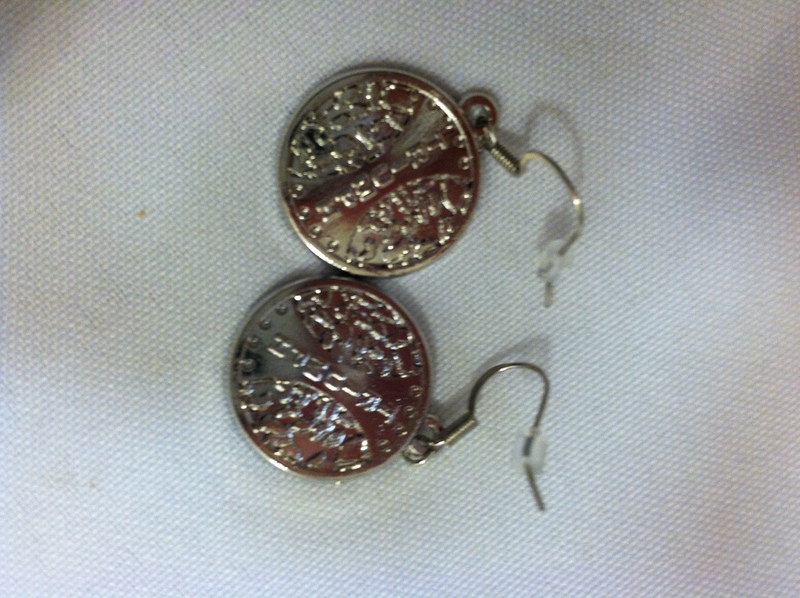 Dress up any outfit with our TOKC Earrings! 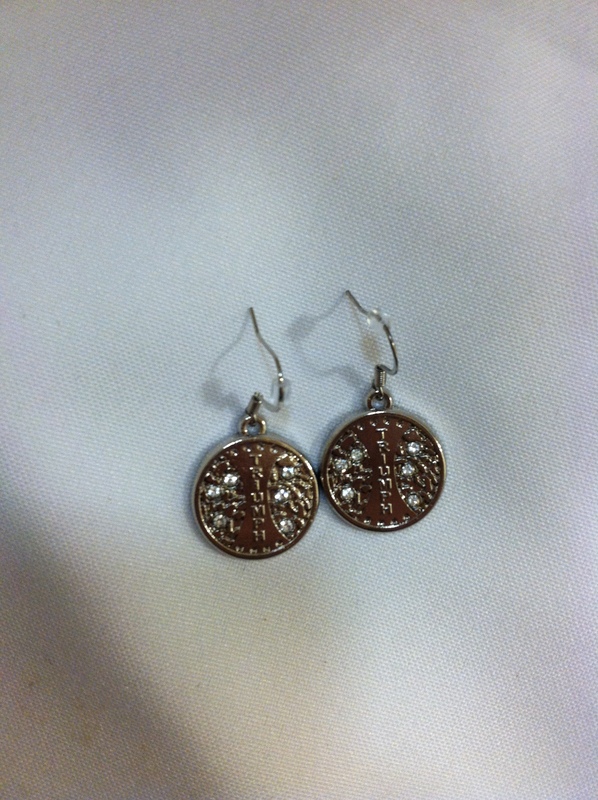 Add a little sparkle to your outfit with these TOKC Silver Earrings with Rhinestones! Always losing your school ID or badge? 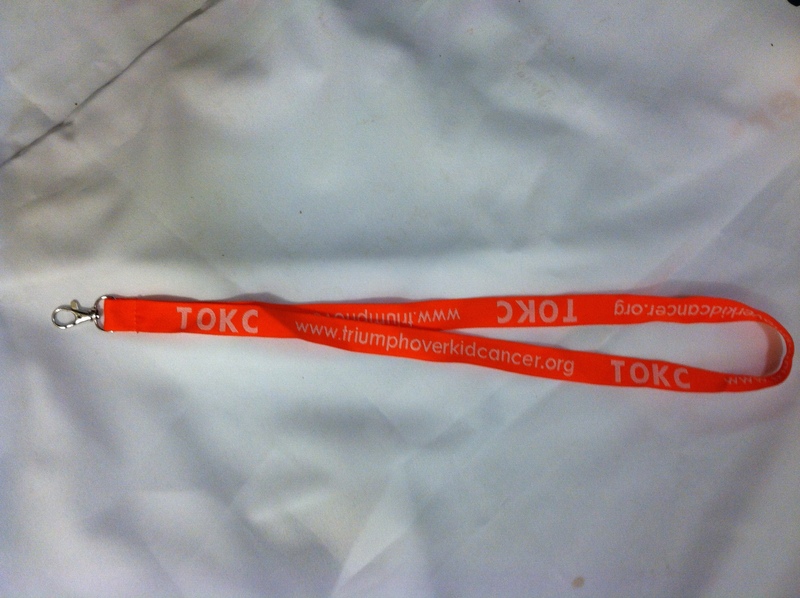 Keep up with it by using a bright orange TOKC lanyard! Our TOKC silicone phone cover is perfect for carrying your ID and money wherever you go! 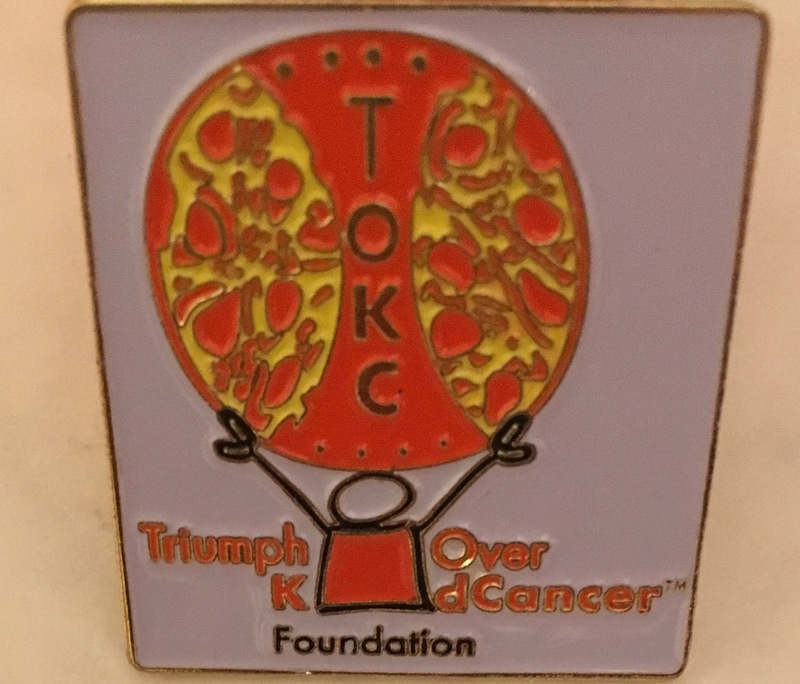 The TOKC pin makes a perfect addition to any outfit or backpack! Rock a TOKC headband at the gym or school! Available in Black or Heather Grey. 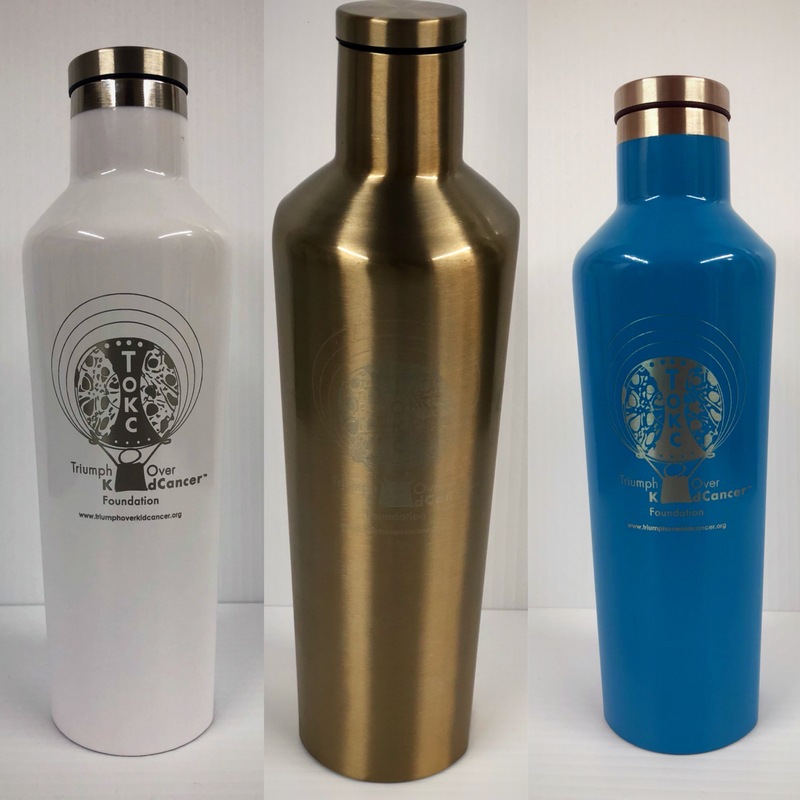 Keep your drinks cold for 25 hours or hot for 12 hours with the TOKC Corkcicle! 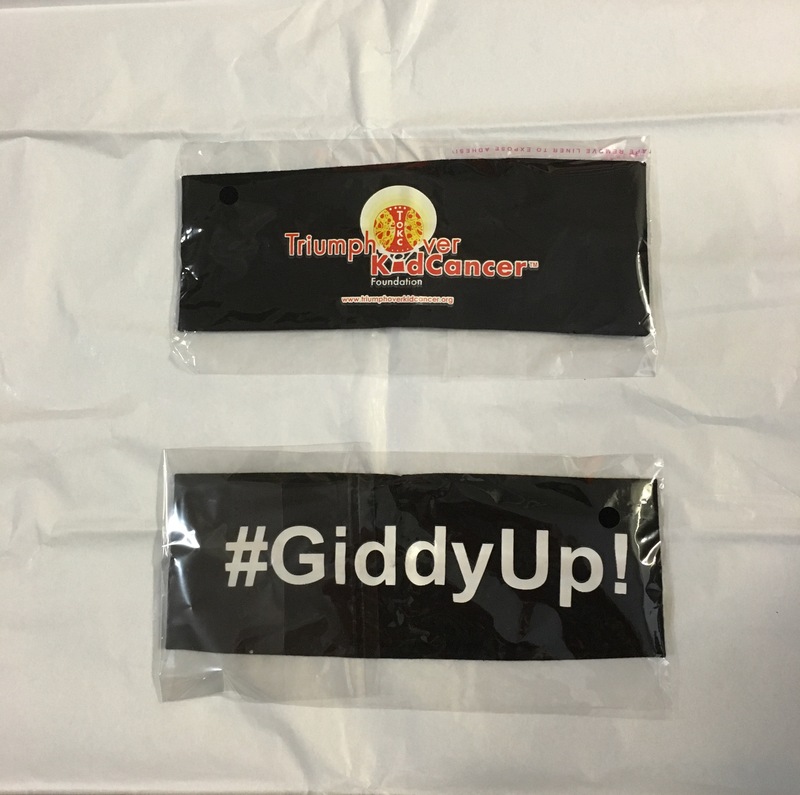 Sport your TOKC and James A. Ragan GiddyUp!Race pride with our bandana! Our TOKC white baseball cap is perfect for keeping your face out of the sun - whether that be for a day on the golf course or a day at the beach! 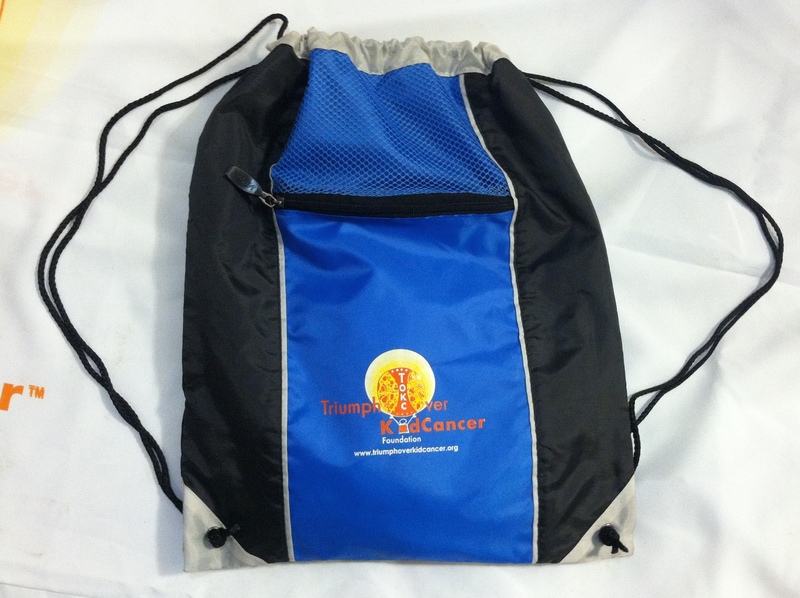 No better way to keep all of your stuff together for school or for practice, than with a TOKC bag! 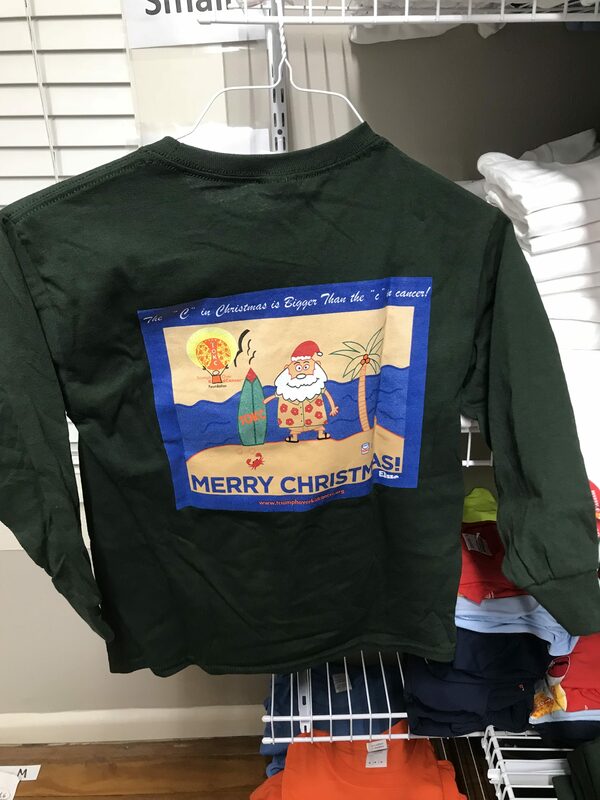 Sleigh this season in your very own TOKC Christmas Shirt! 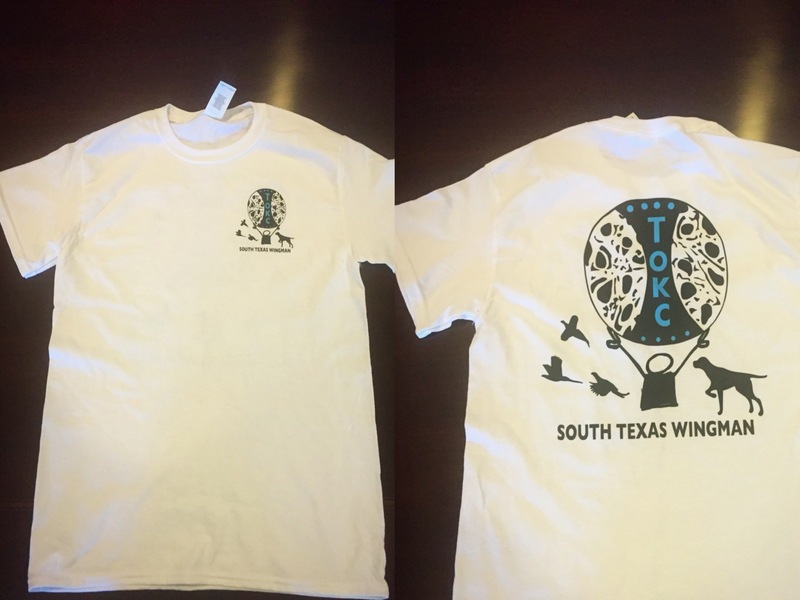 For our youngest TOKC friends and fun-havers, you're never too young to show your support! 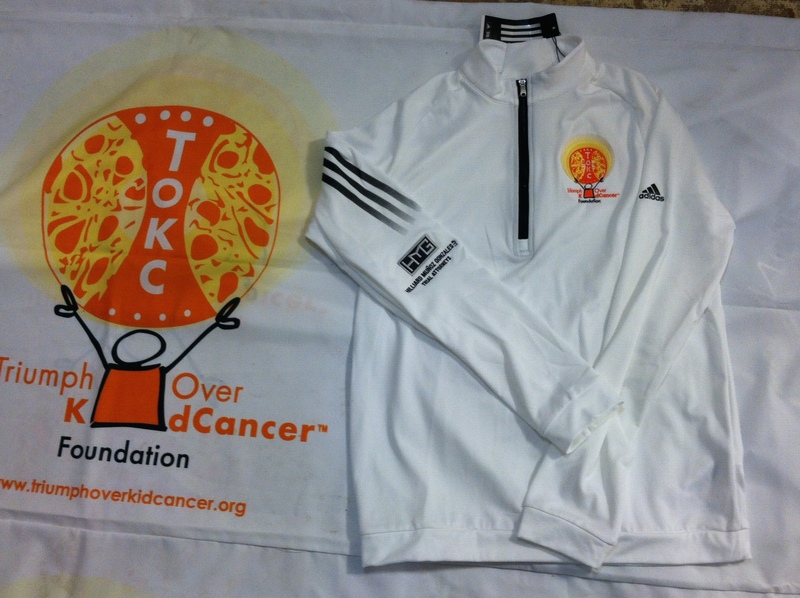 Show your support as a TOKC friend and fun-haver! Stay warm, but look cool, in one of our HMG Hoodies! 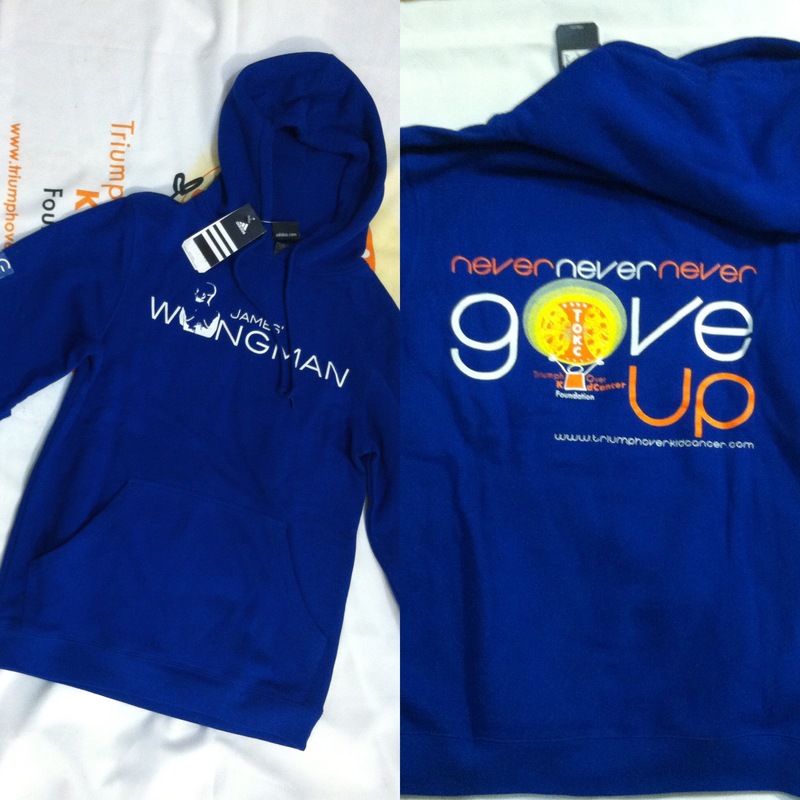 Stay warm in our signature James' Wingman Hoodie! NEW! 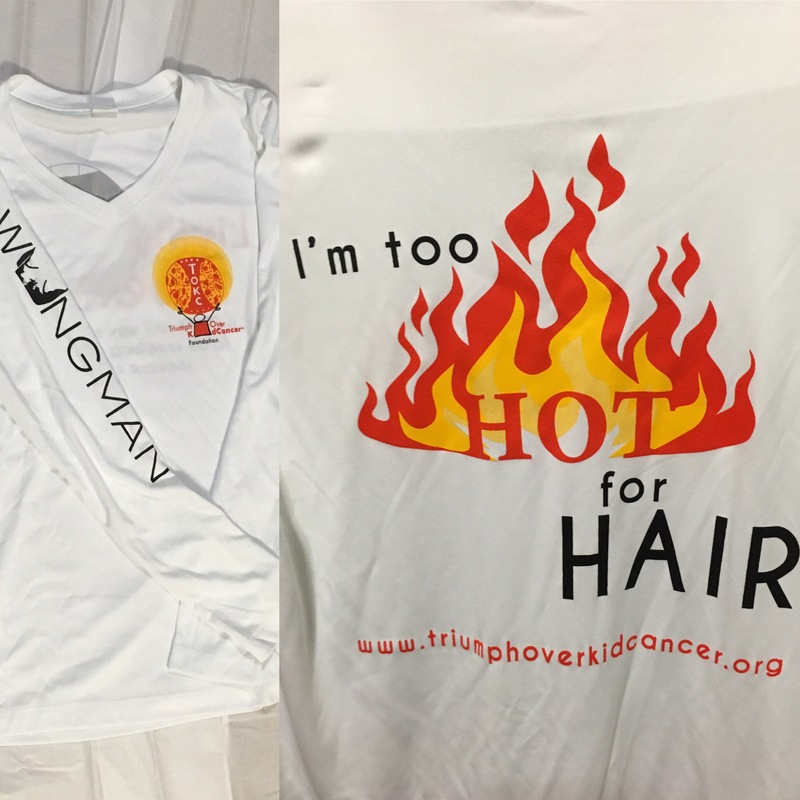 Show your support and help raise awareness in your very own TOKC South Texas Wingman White Short-Sleeve T-Shirt. 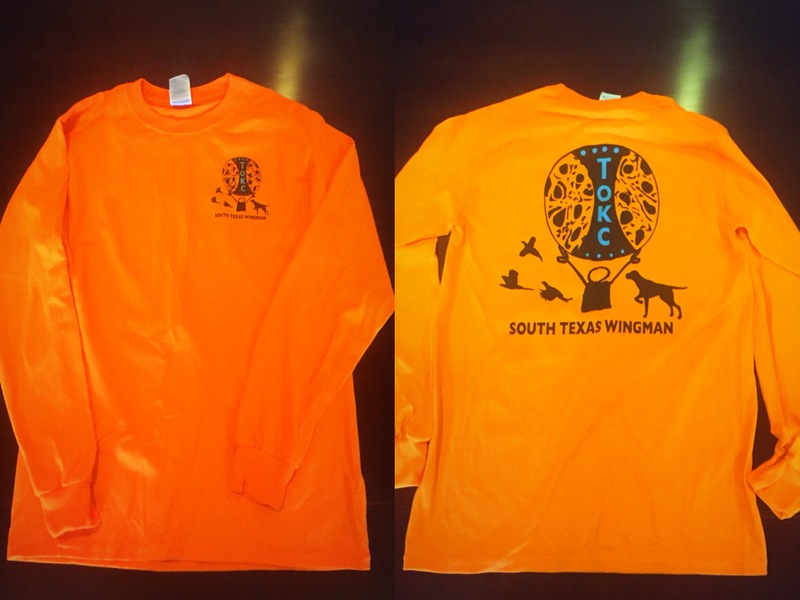 Show your support and help raise awareness in your very own TOKC South Texas Wingman Orange Long-Sleeve T-Shirt. NEW! 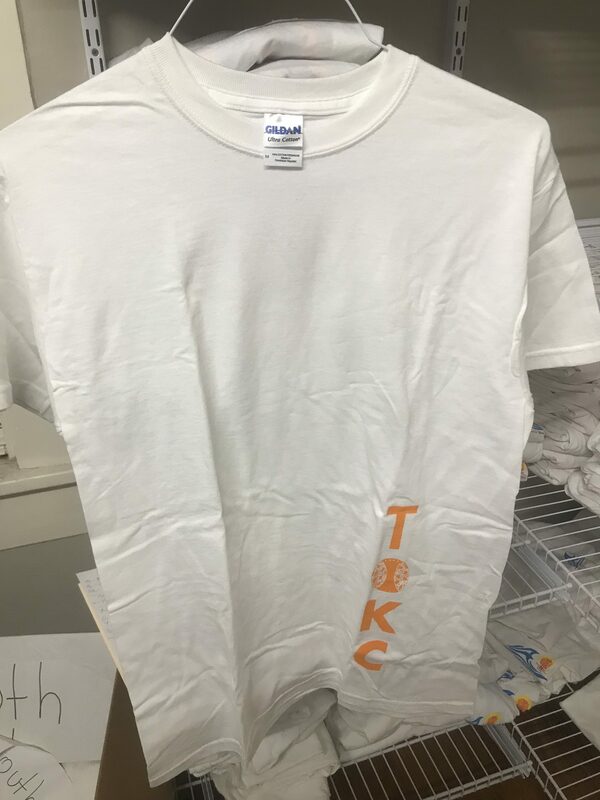 Show your support and help raise awareness in your very own TOKC Texas Made White Long-Sleeve T-Shirt. 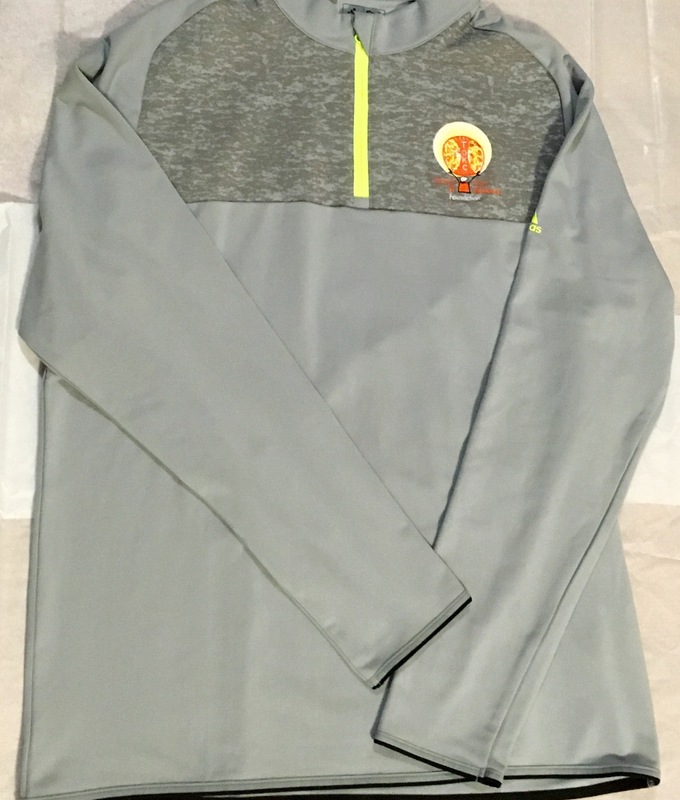 This long sleeve TOKC pullover is perfect for chilly mornings or evenings! 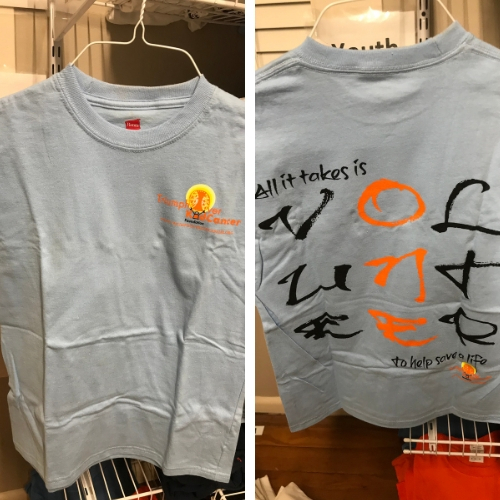 You're never too young to sport TOKC gear! 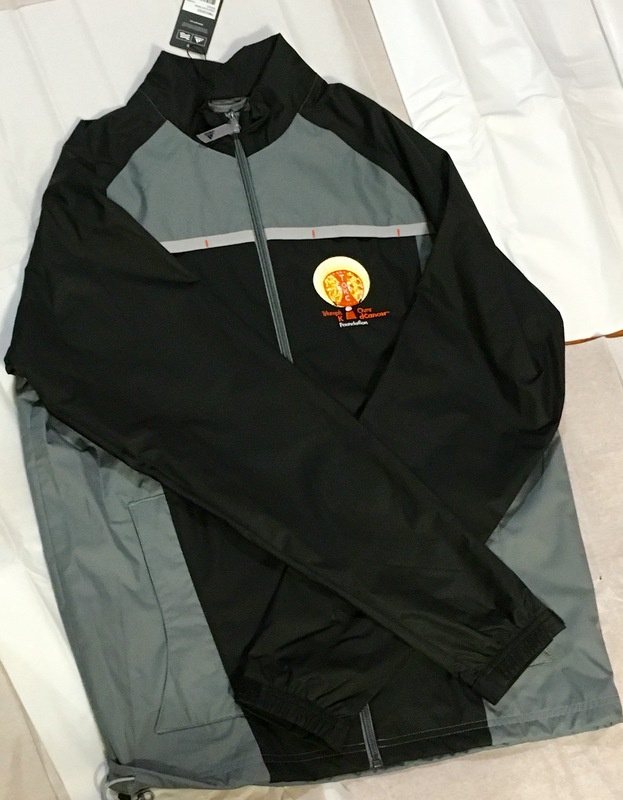 Stay dry in our TOKC Adidas rain jacket! 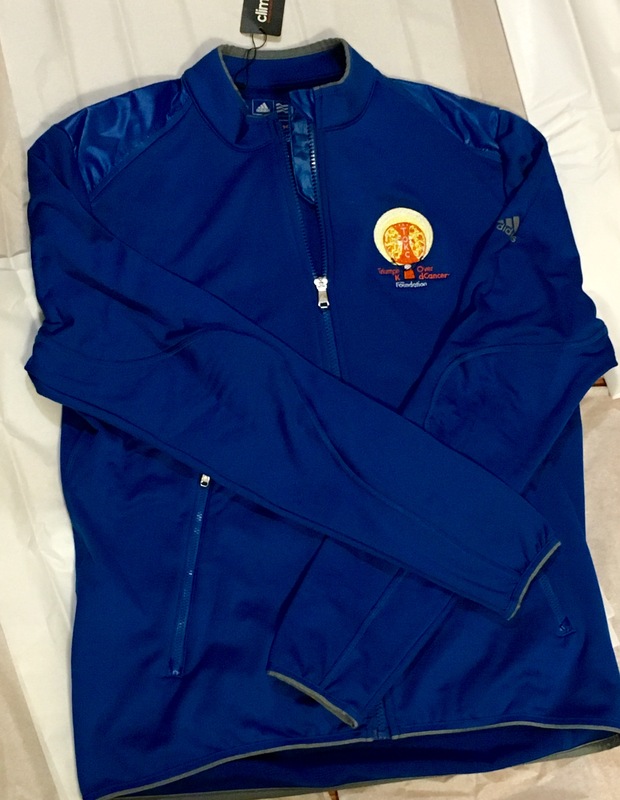 Escape the wind and cold with one of our TOKC Adidas Clima-Gear jackets! 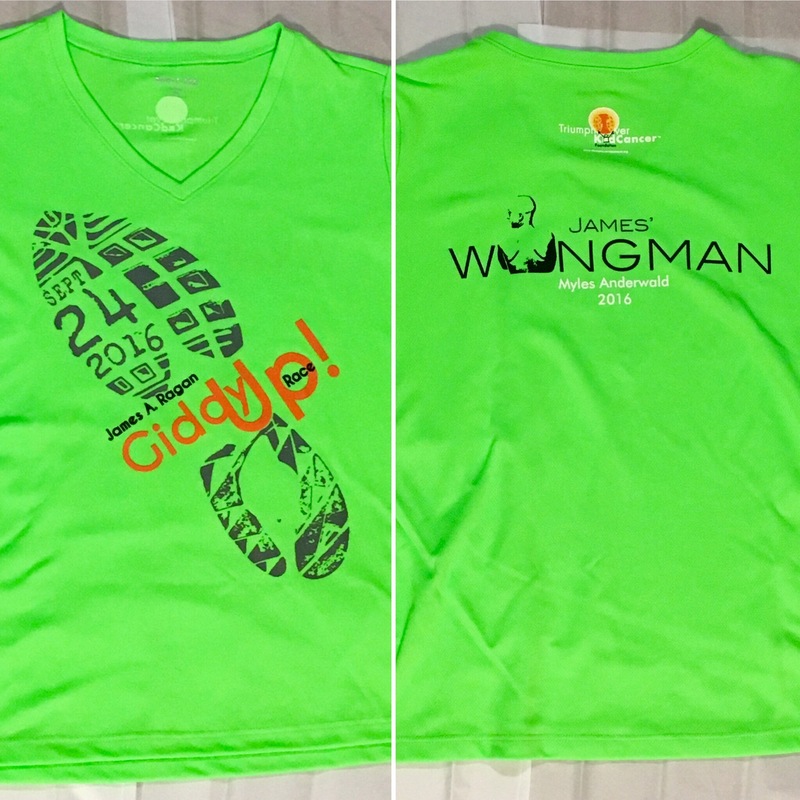 Stand out in a crowd with our bright green 3rd Annual James A. Ragan GiddyUp!Race Shirt. Men and Women sizes available! 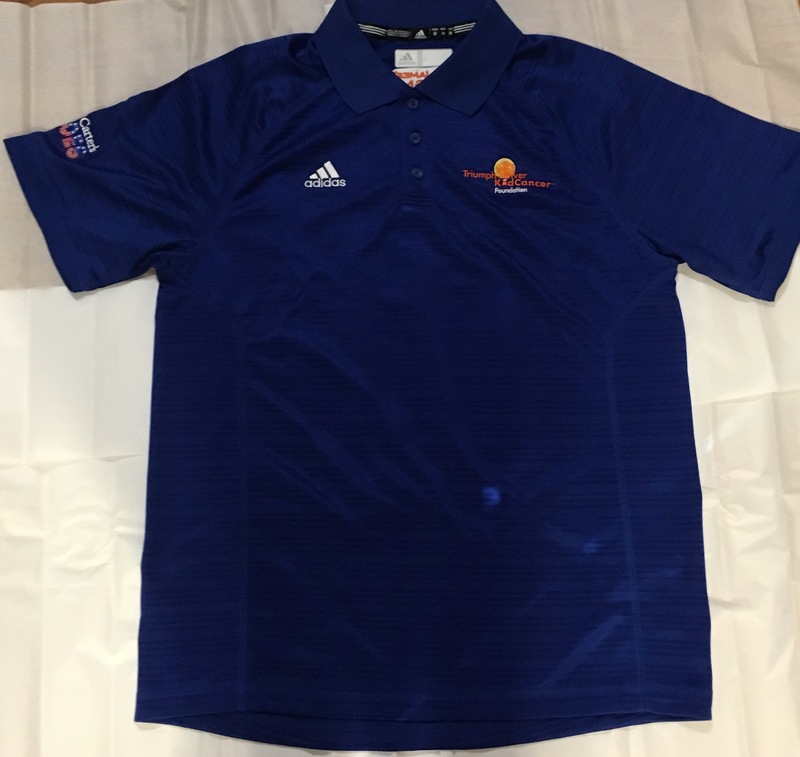 This royal blue TOKC polo is perfect for your weekly round of golf! 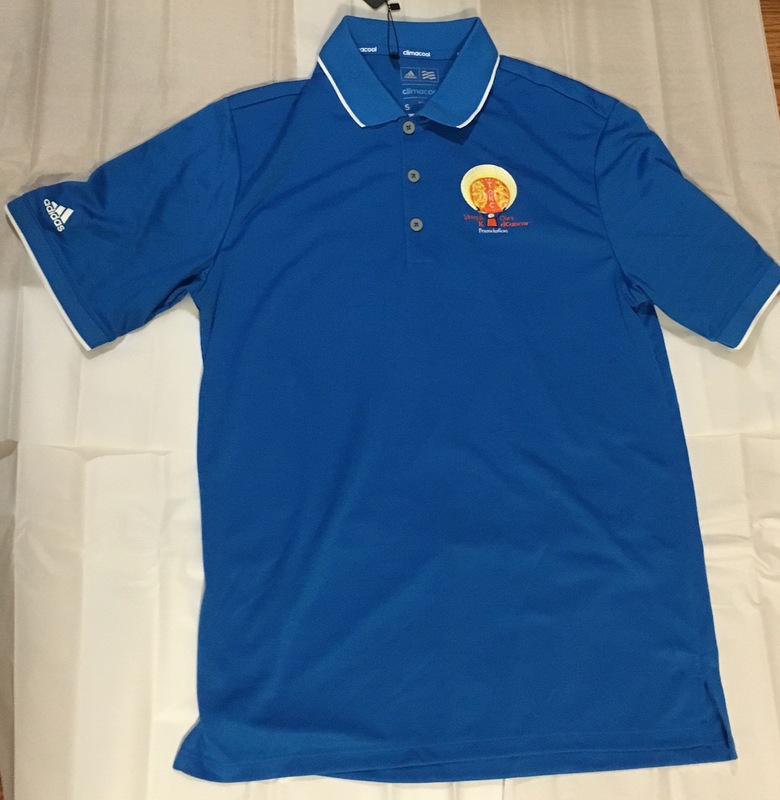 This blue TOKC polo is perfect for your weekly round of golf. Men and Women sizes available! 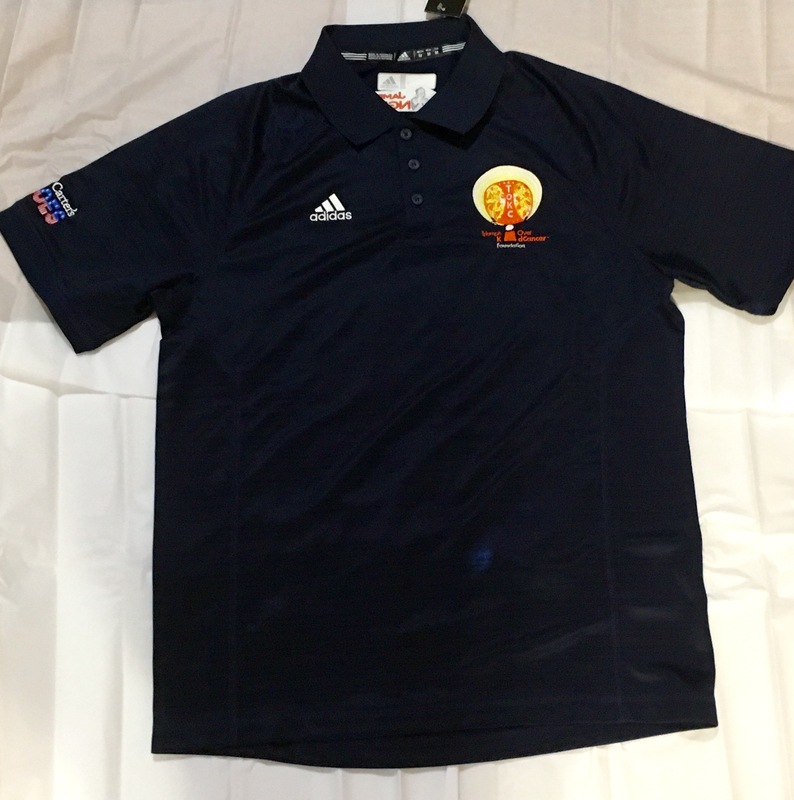 This navy TOKC polo is perfect for your weekly round of golf. Men and Women sizes available! 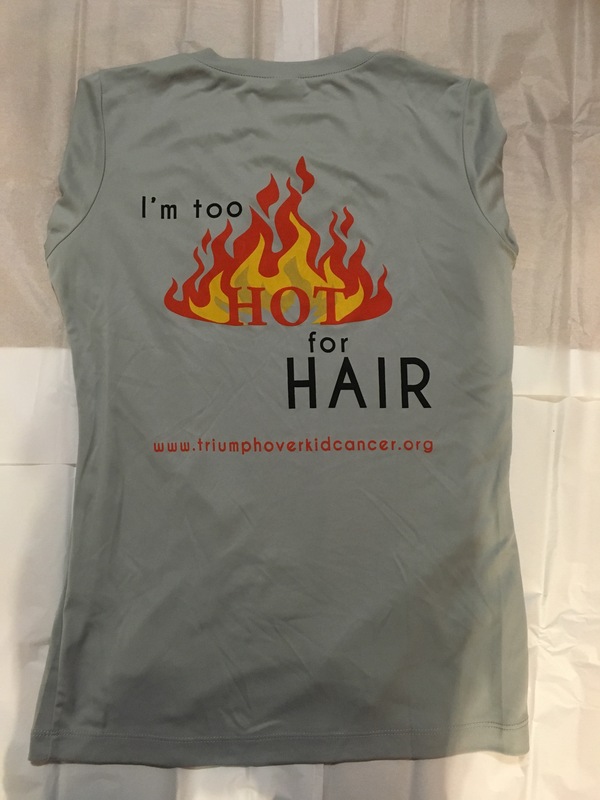 Your youths can proudly sport these "Too Hot For Hair" tees! 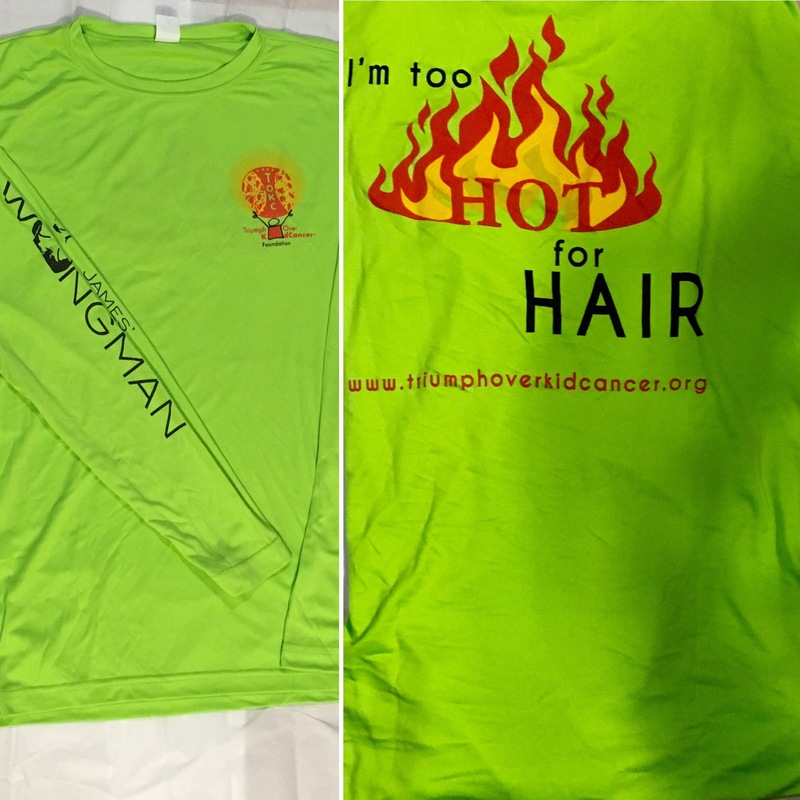 The "Too Hot For Hair" long-sleeved tees are perfect for cooler weather! 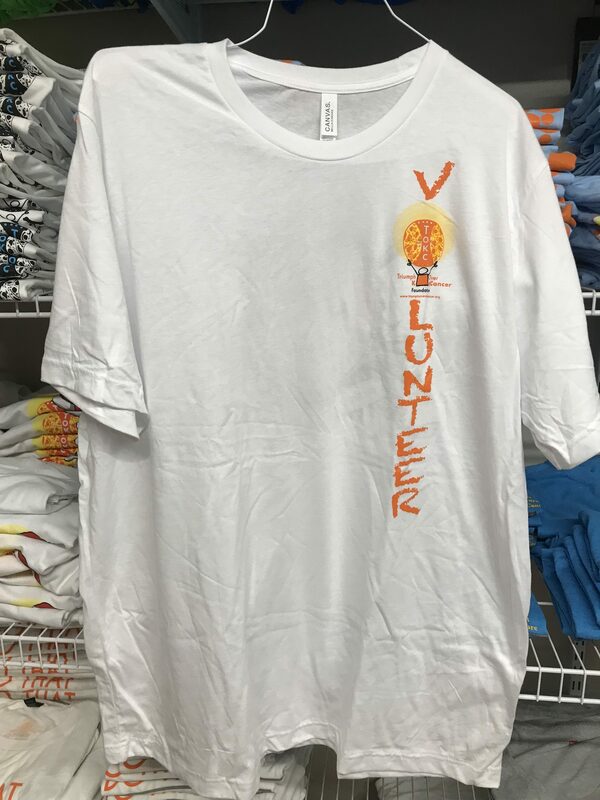 Available in Men, Women & Youth sizes. 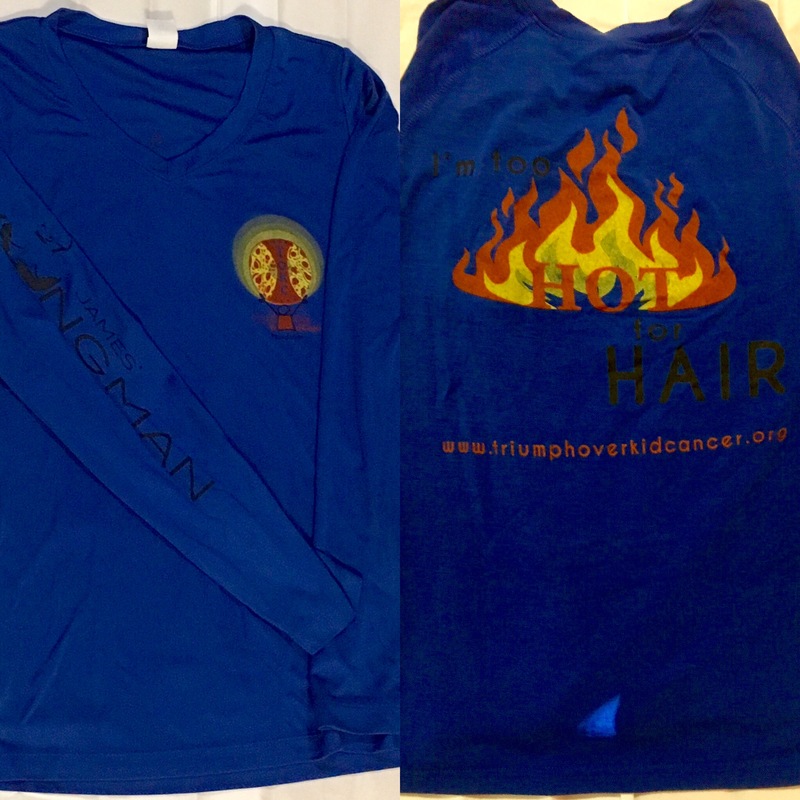 The "Too Hot For Hair" long-sleeved tees are perfect for cooler weather! 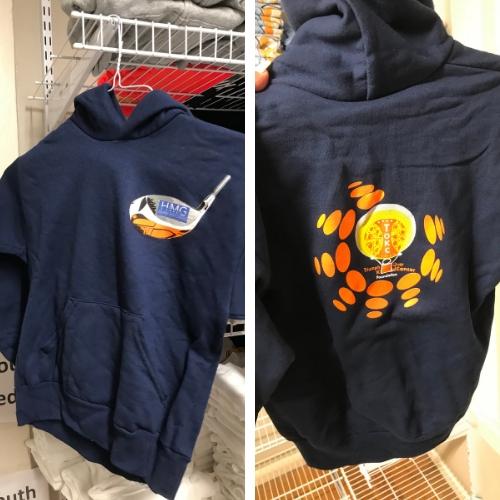 The "Until 20" long-sleeved tees are perfect for cooler weather! 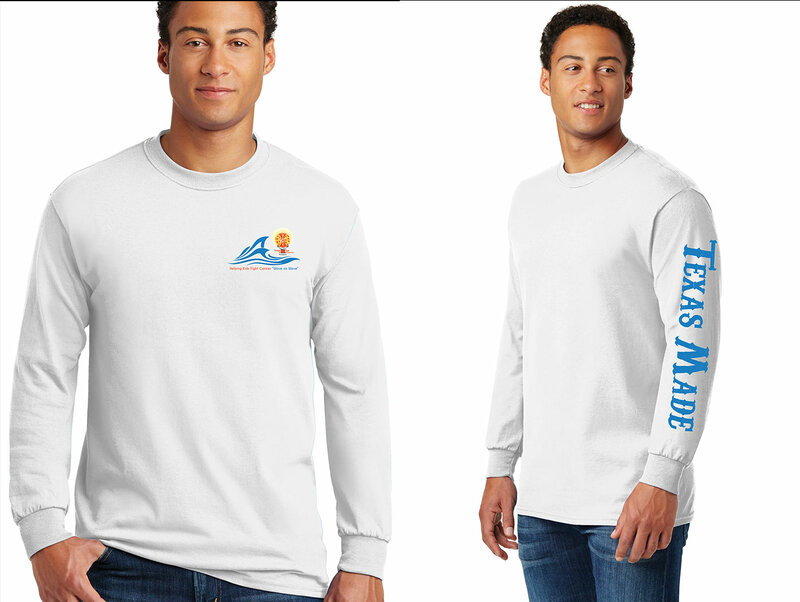 The "Until" long-sleeved tees are perfect for cooler weather! 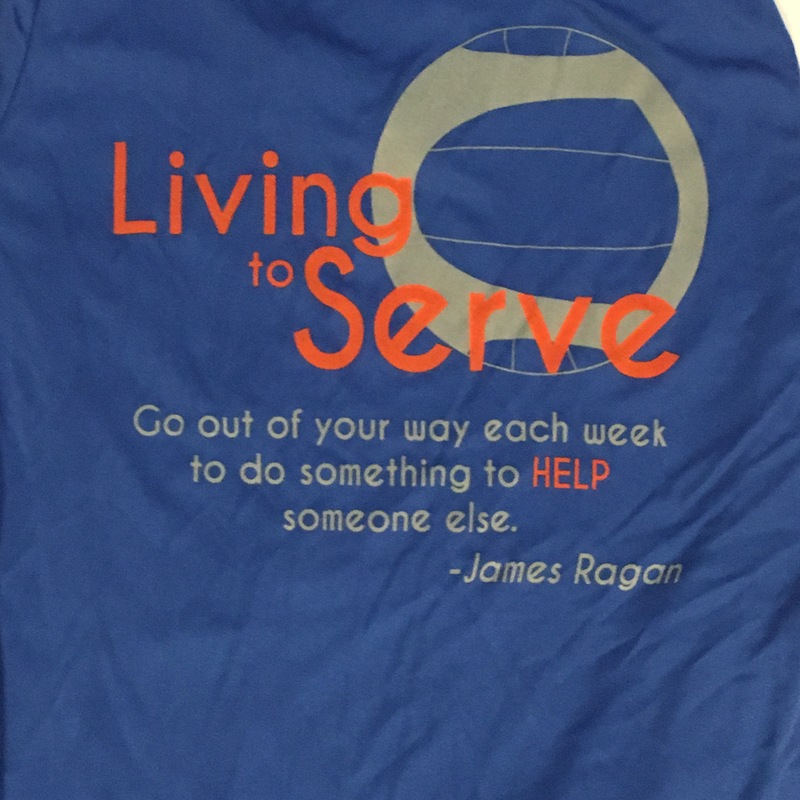 The "Living to Serve" long-sleeved tees are perfect for cooler weather. 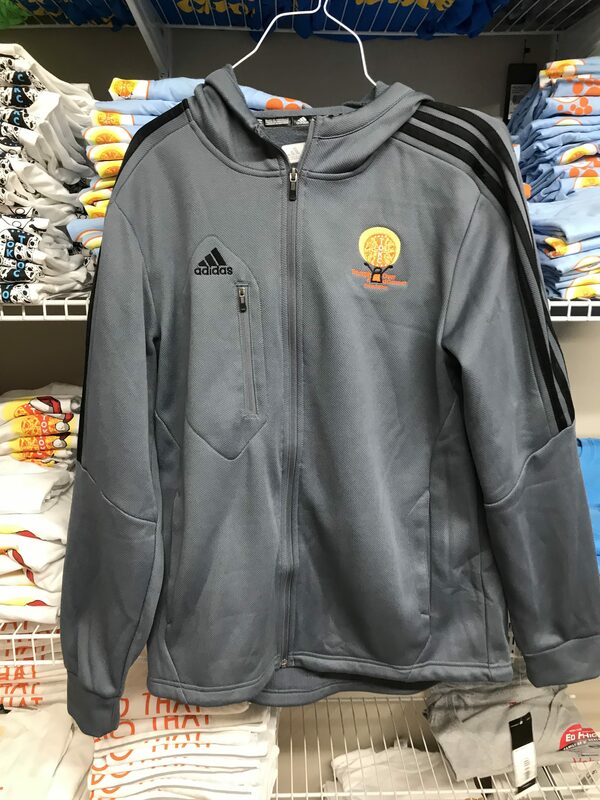 Youth & Adult sizes available! 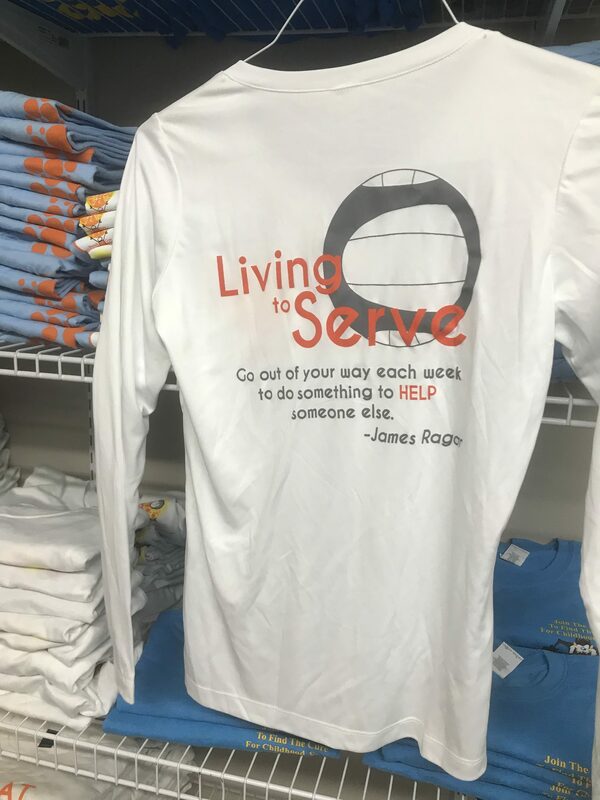 The "Living to Serve" long-sleeved dri-fit tees are perfect for cooler weather. #DoThatOneThing! and purchase your very own #TeamElissa t-shirt in honor Elissa. 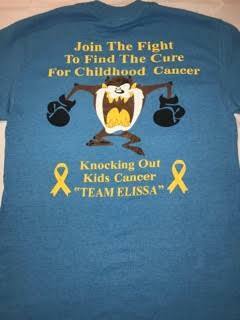 "Join the fight to find the cure for childhood cancer" by sporting one of these comfy t-shirts from Team Elissa! 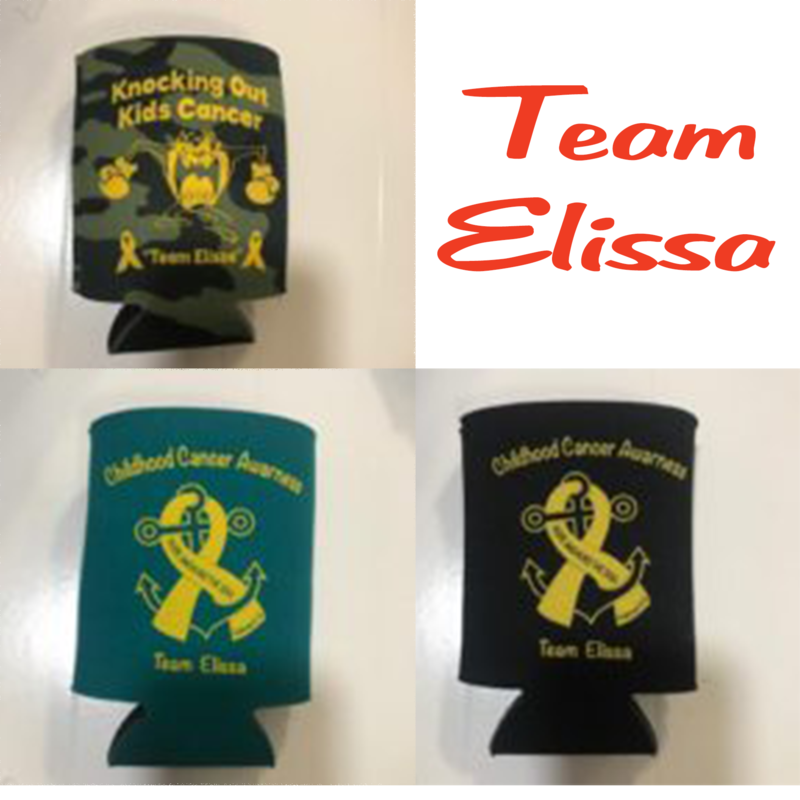 Help raise awareness while keeping your favorite beverage cold with one of these custom "Hope Anchors The Soul" koosies from Team Elissa! 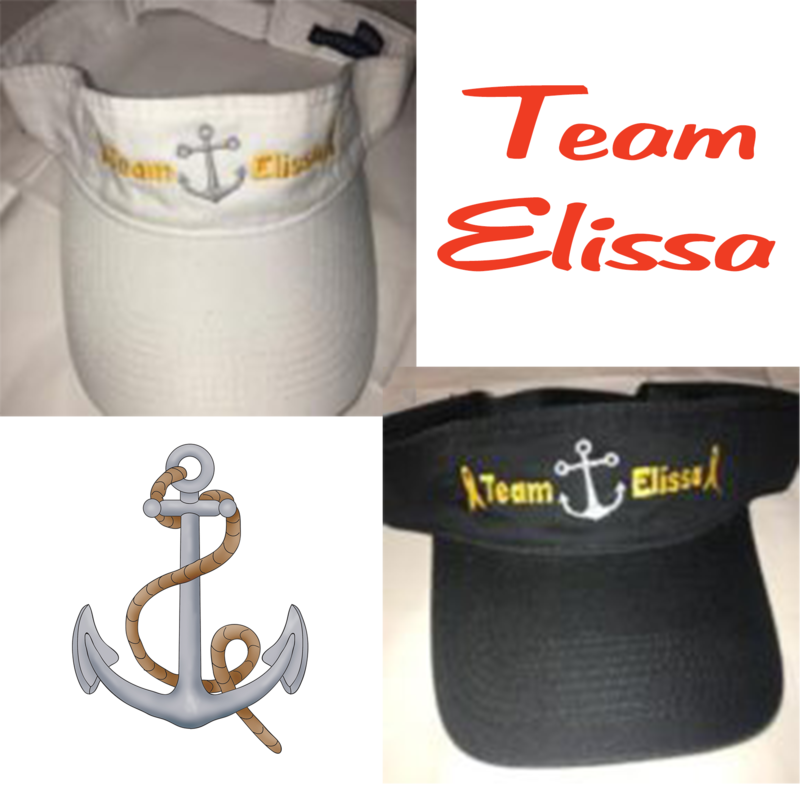 Stay in the shade while helping raise awareness in one of these sporty visors from Team Elissa! 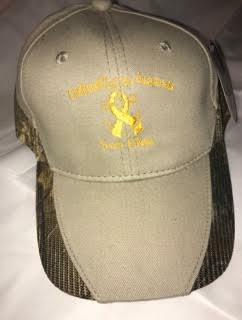 Stay in the shade while helping raise awareness in one of these sporty caps from Team Elissa!